Motor yacht ANTISAN is a 33, 0m (108' 3") charter yacht built by Alalunga at well-known Spertini Shipyard in 1985. 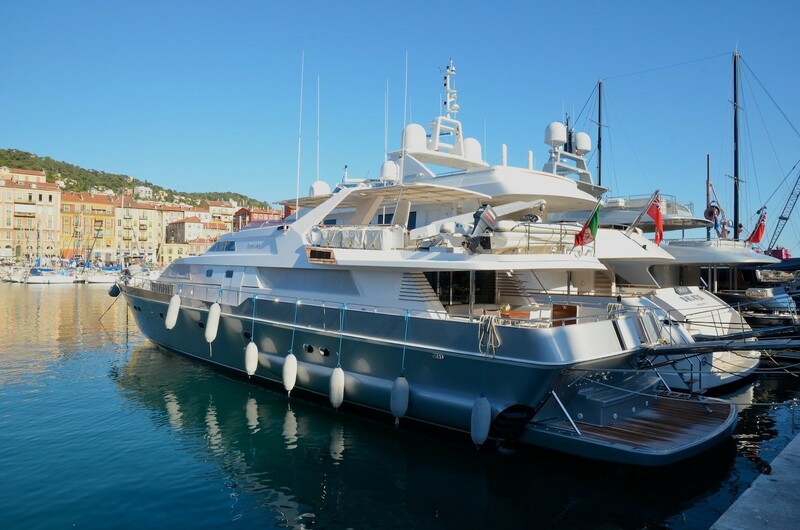 She has since received several refits and upgrades. 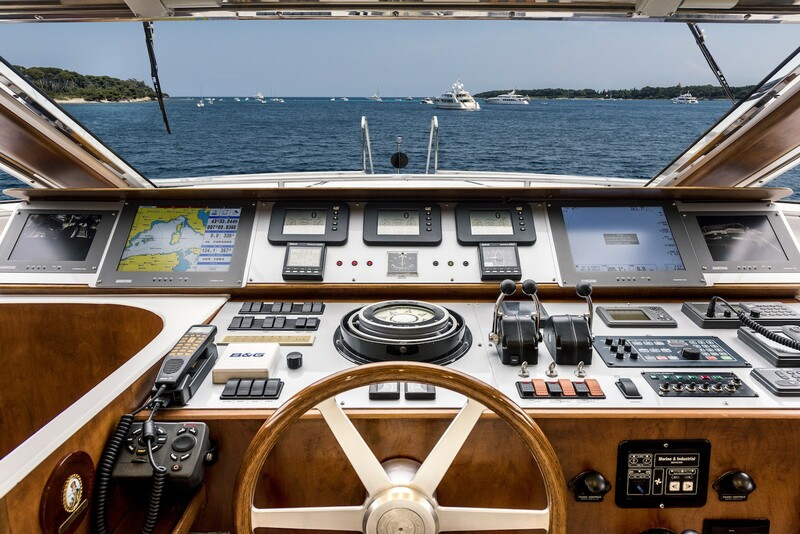 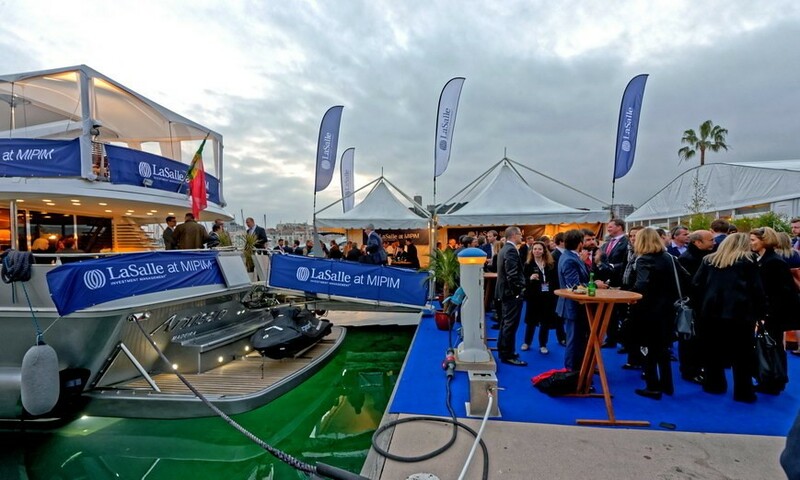 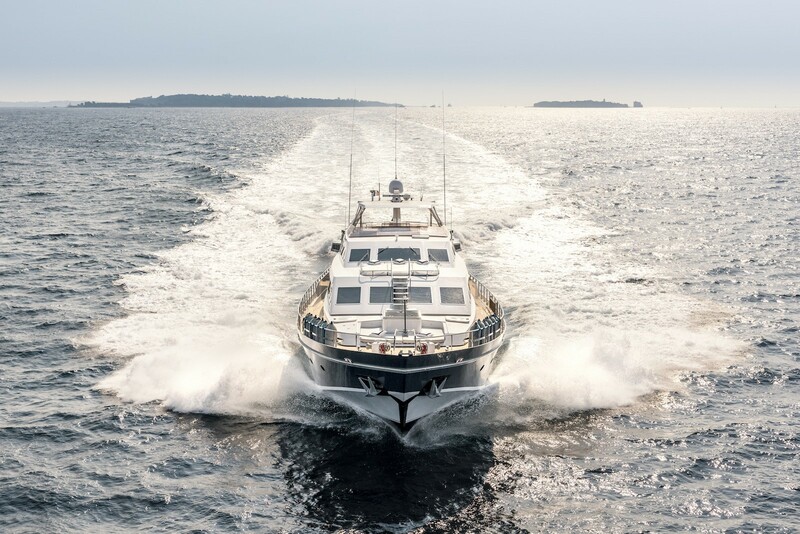 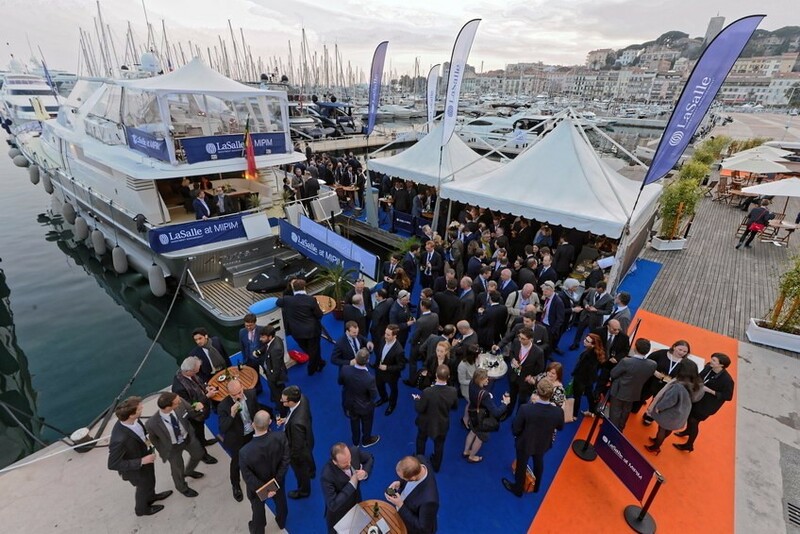 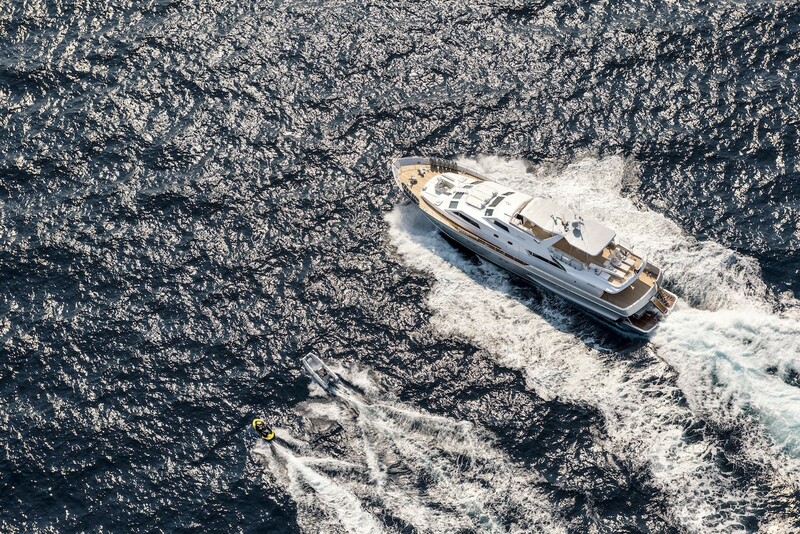 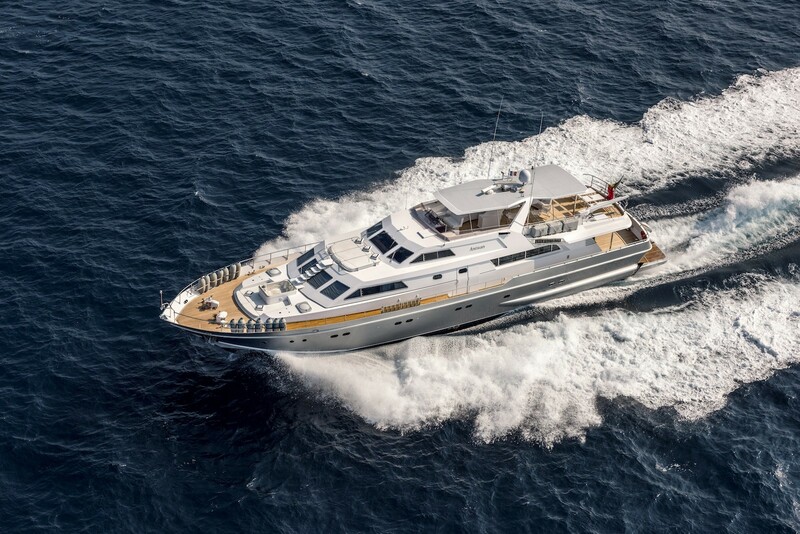 Charter yacht ANTISAN was built to the highest safety and quality standards required for Commercial Certification. 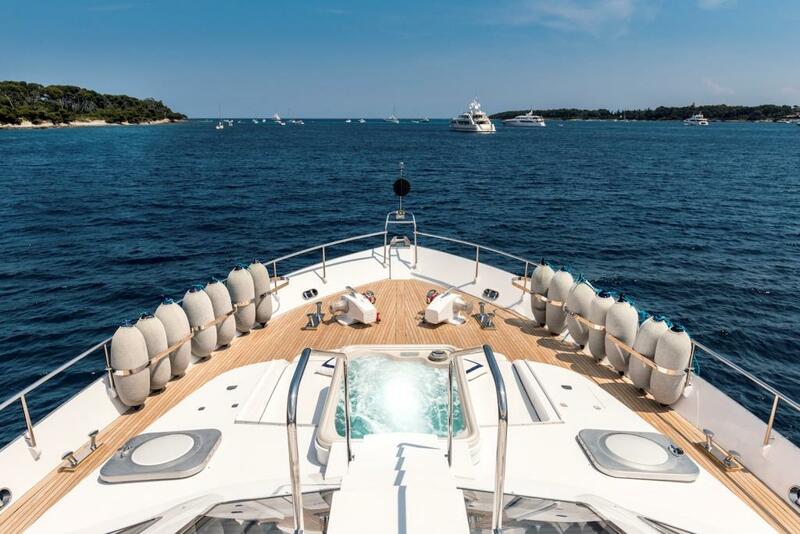 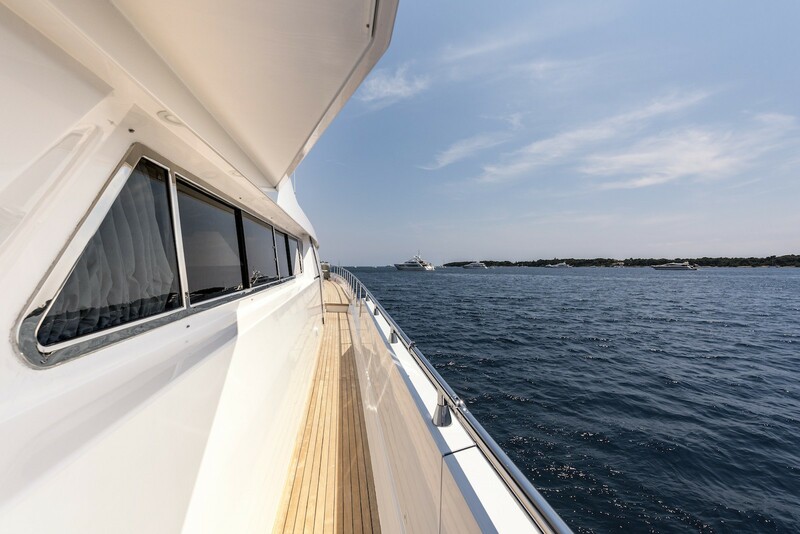 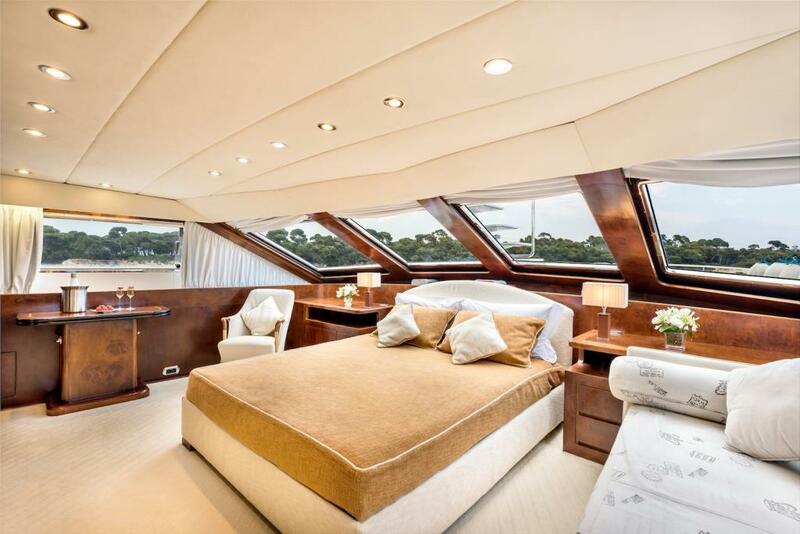 Motor yacht ANTISAN measures 33m with a 7.7 m beam offering her guests spacious interior rooms and exterior spaces usually found on much larger yachts. 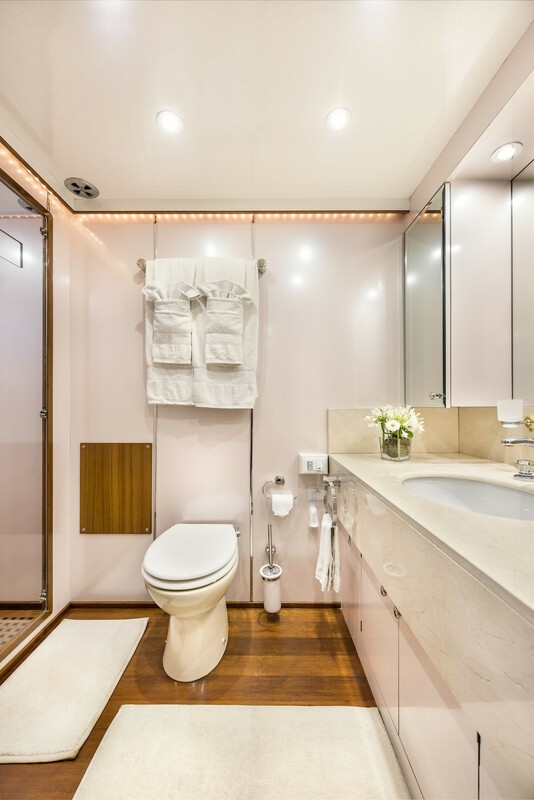 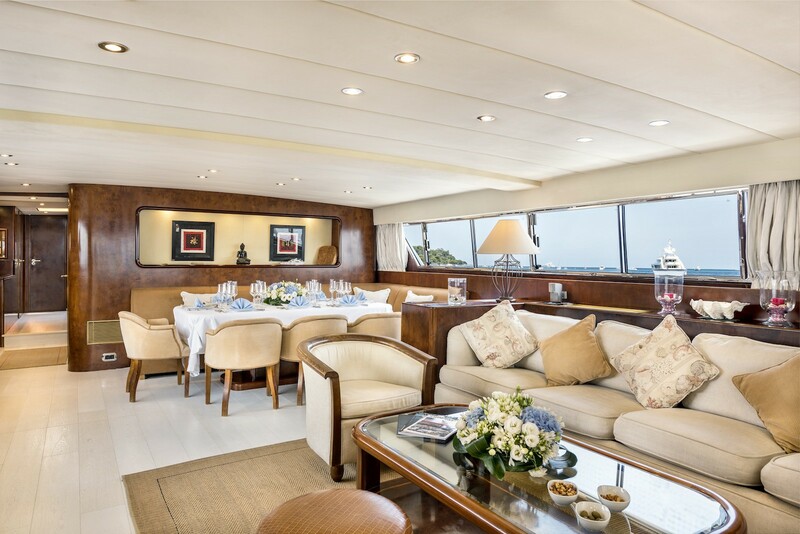 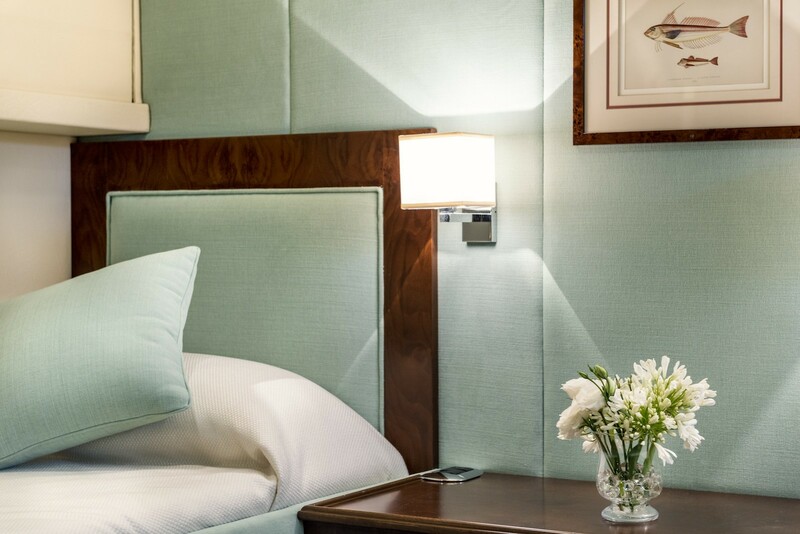 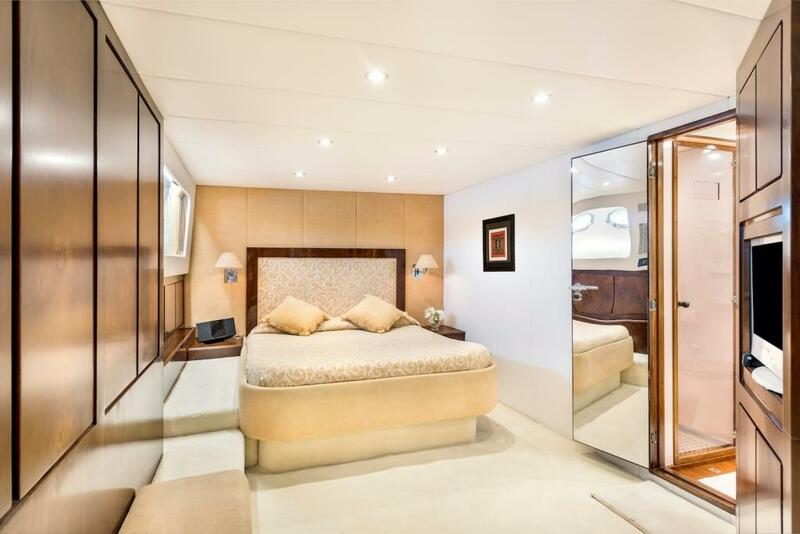 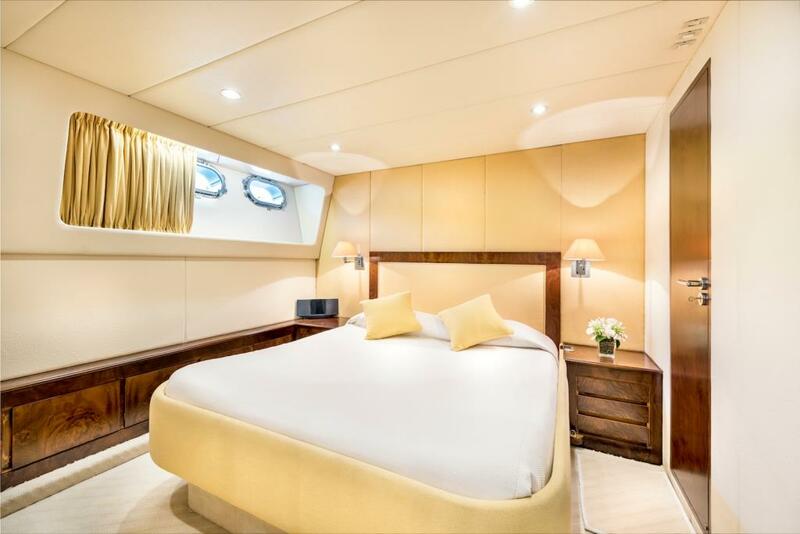 M/Y ANTISAN features an interior with neutral colours, with walnut panelling fitted with elegant furniture and expertly matched pastel coloured fabrics. 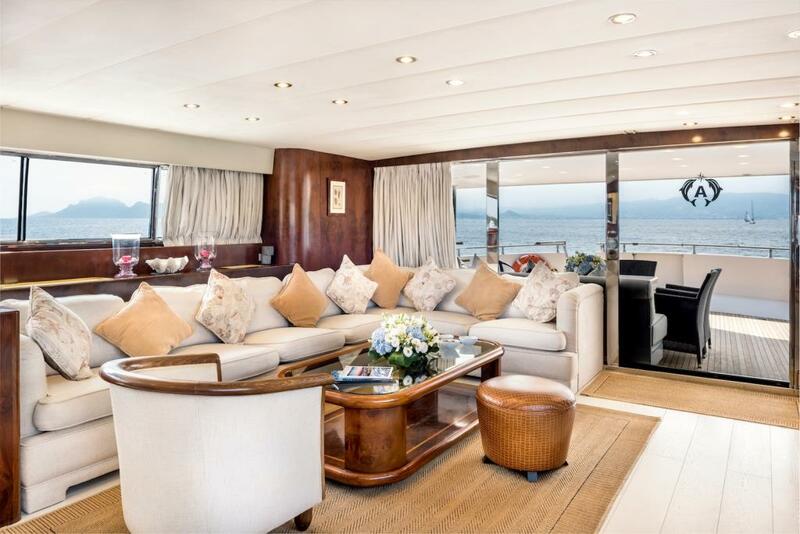 Her salon has a spacious sitting-room with plasma TV and BOSE Sound System plus a separate dining room. 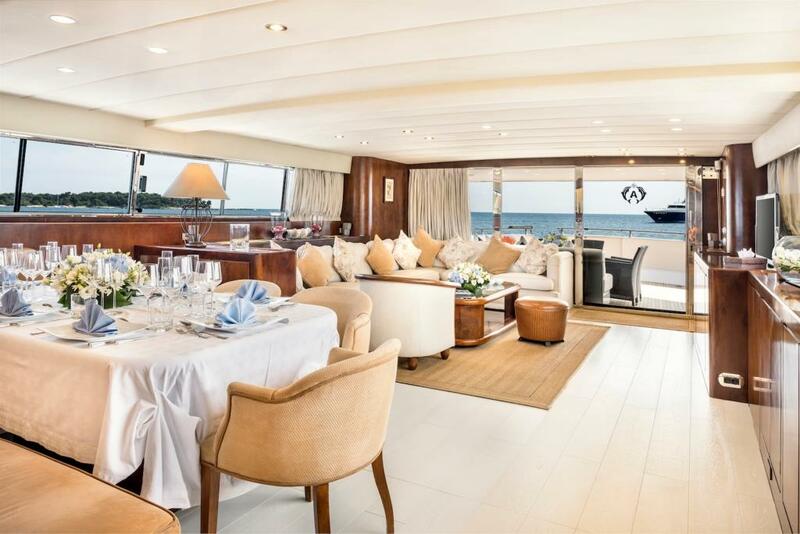 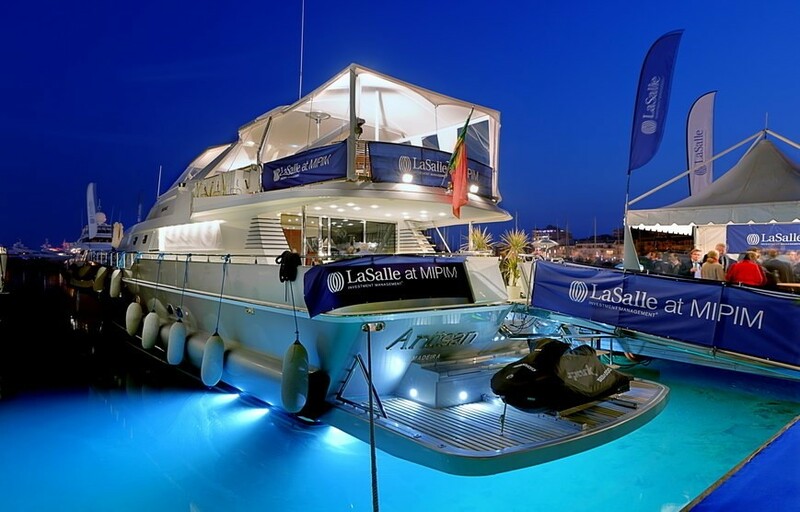 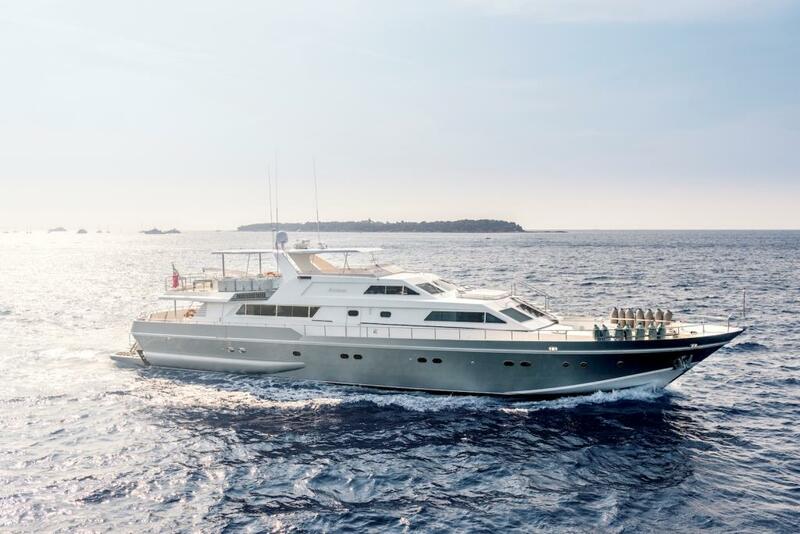 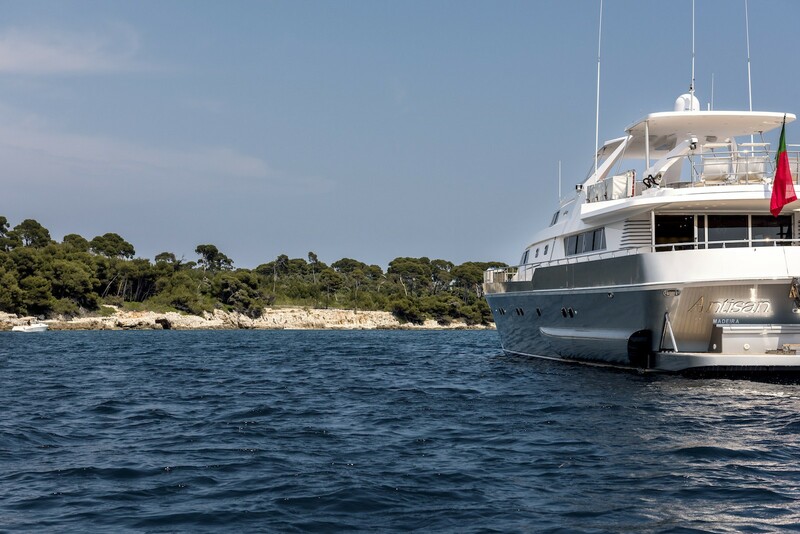 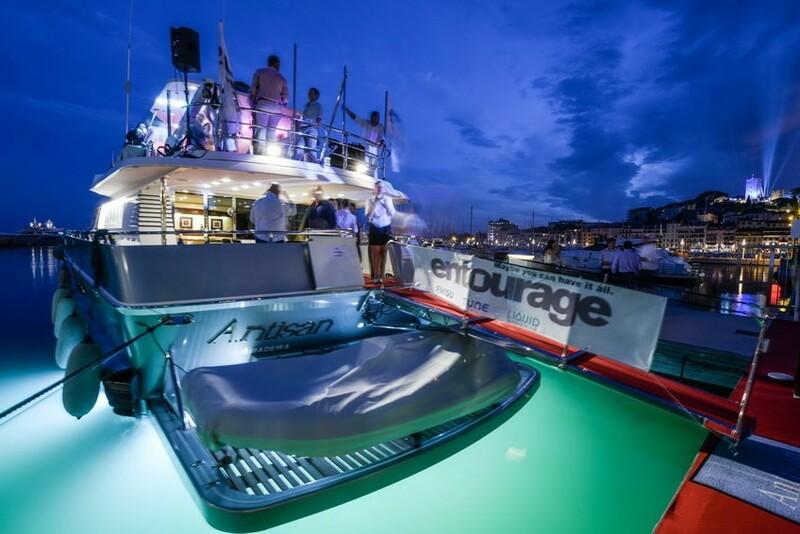 Motor yacht ANTISAN can accommodate up to 12 guests overnight with the ability to have 40 guests onboard cruising. 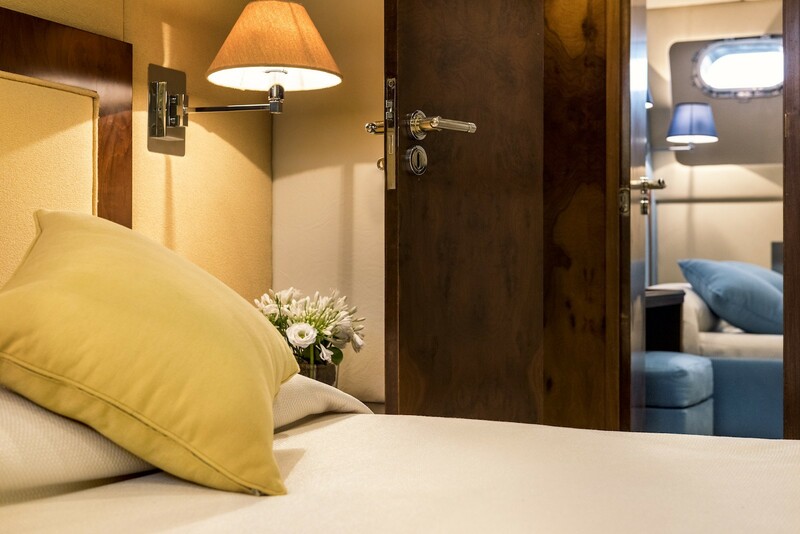 Her 5 cabins comprise of a full width master cabin located on the main deck forward with king size bed, sitting area, wardrobe and spa pool bathroom with shower plus a convertible sofa. 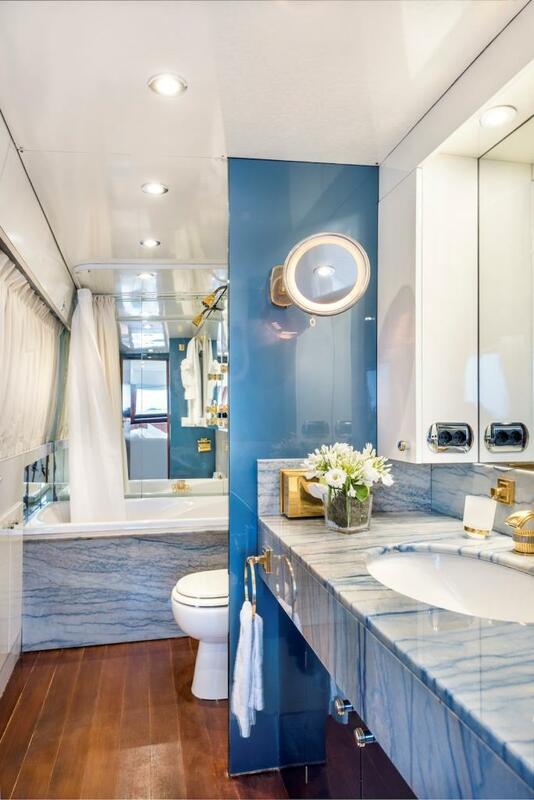 The remaining cabins are located on the Lower deck and consist of 3 queen bedded cabins with stall showers, and 1 twin bedded cabin with stall shower plus a 1 pullman bunk bed. 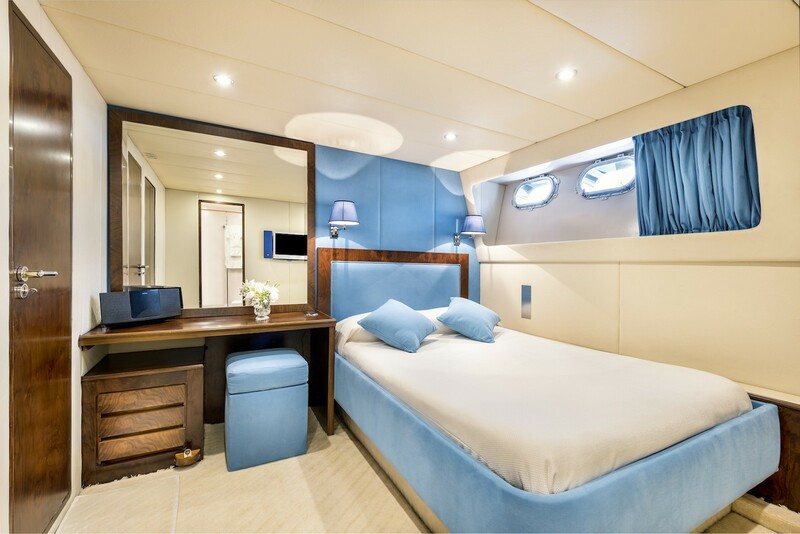 There is a TV with SKY Decoder and stereo and air-conditioning in each cabin. 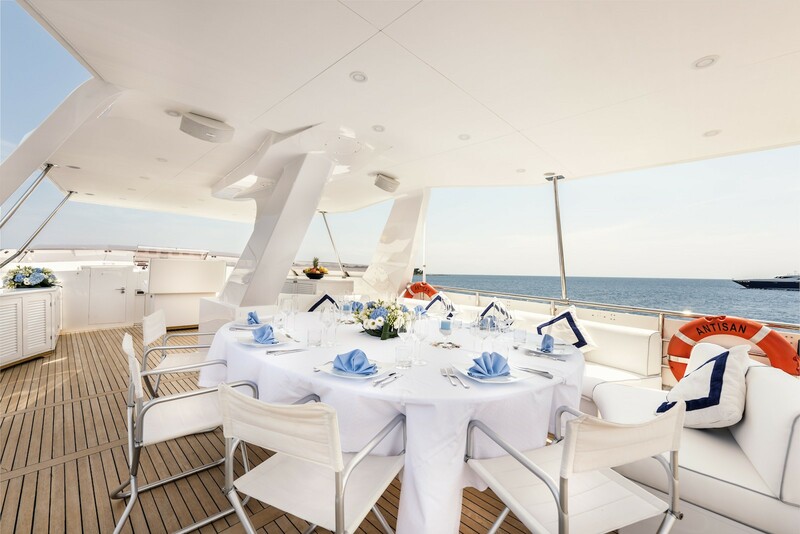 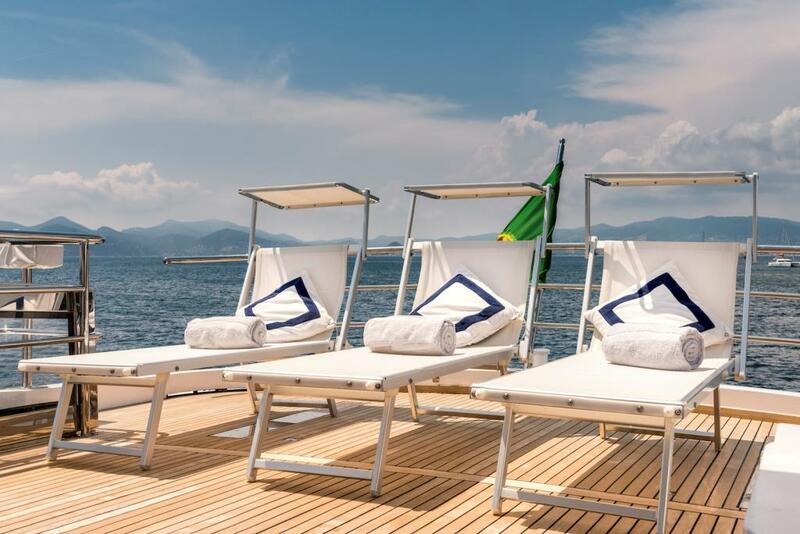 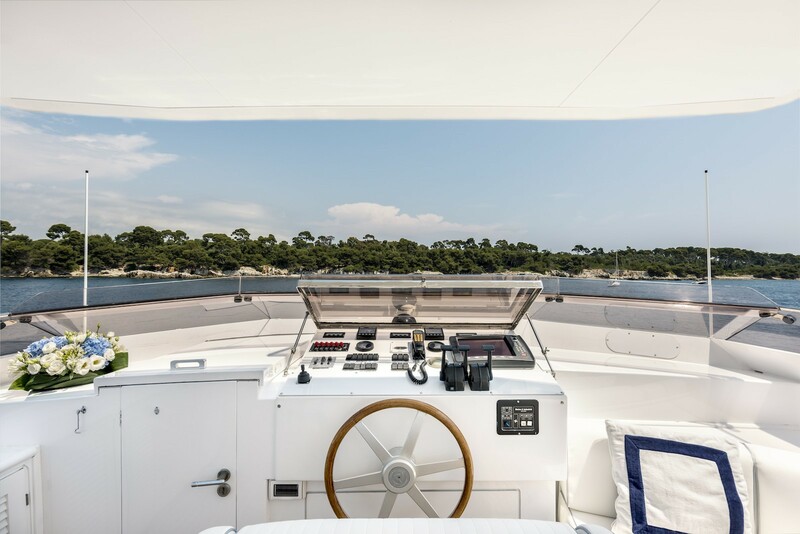 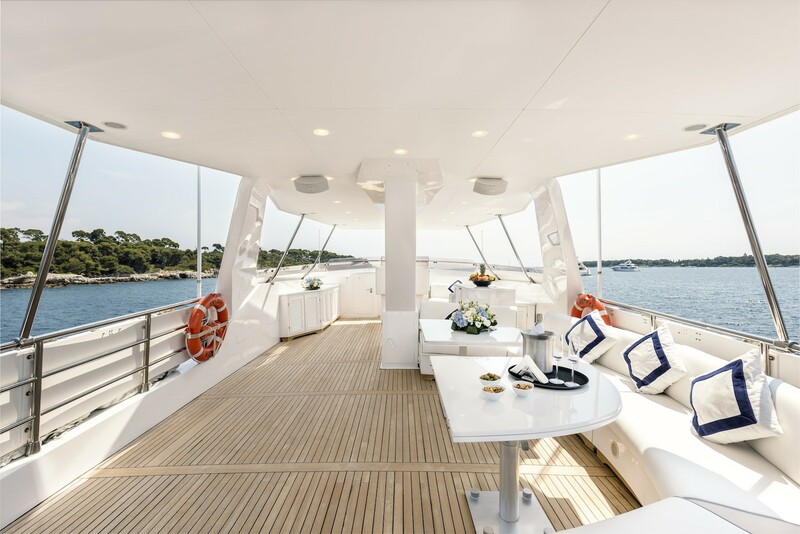 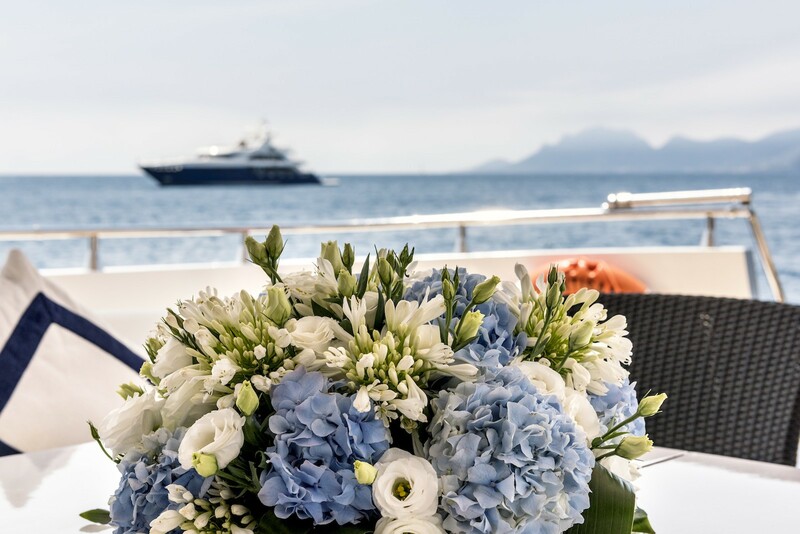 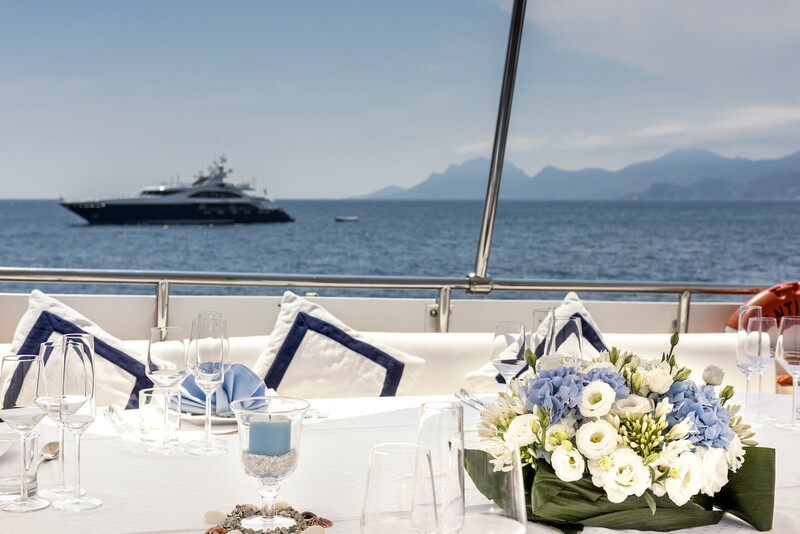 Yacht ANTISAN boasts spacious outdoor areas including a large aft deck with a table for 10-12 guests to dine al fresco and a spacious sunbathing area forward. Her enormous upper deck is certainly another of motor yacht ANTISANS strengths. 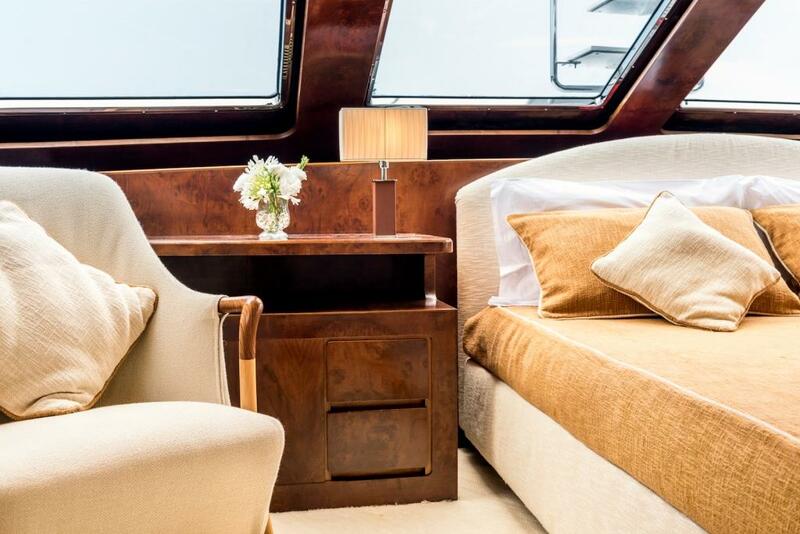 There is space to lie on a large sun pads or sit on the comfortable sofas in the shade of the bimini, perfect for dinner too. 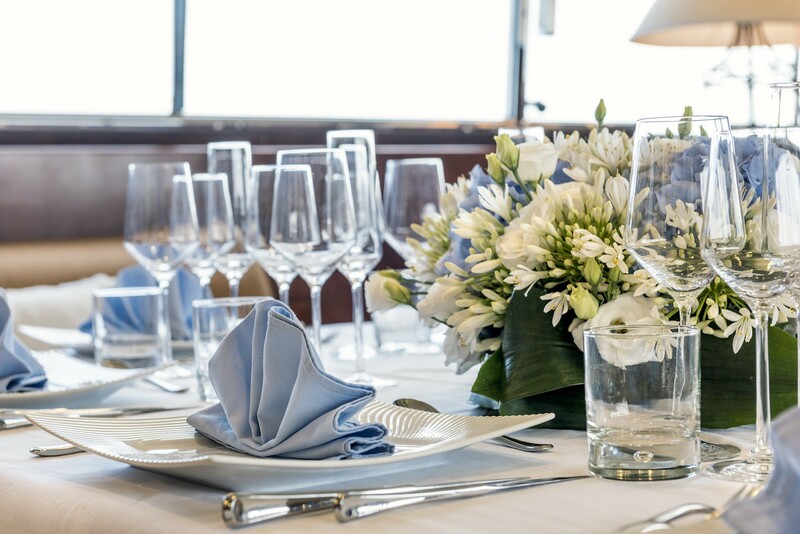 This area is ideal for corporate entertaining and events. 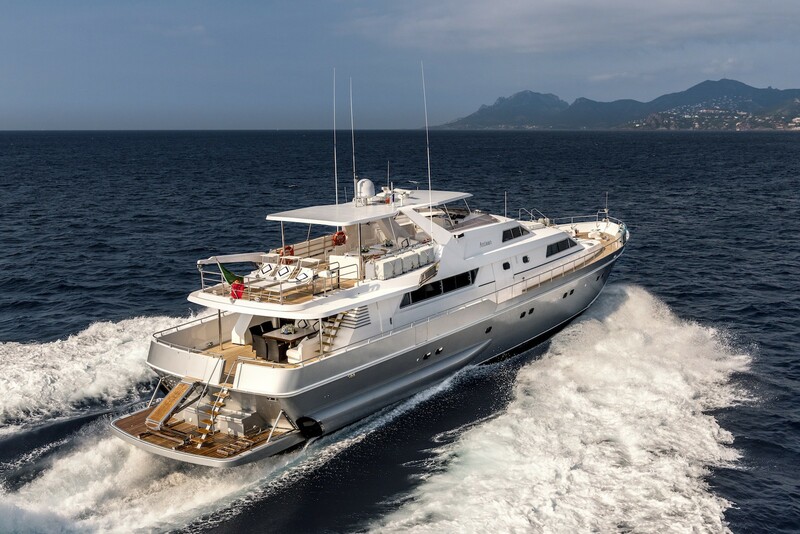 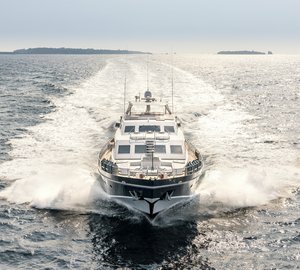 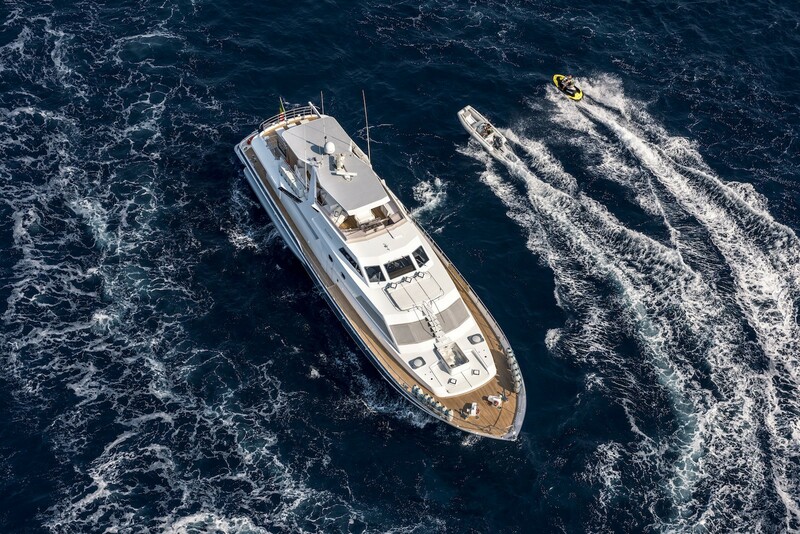 Charter yacht ANTISAN offers the unique possibility to cruise with up to 40 guests onboard. 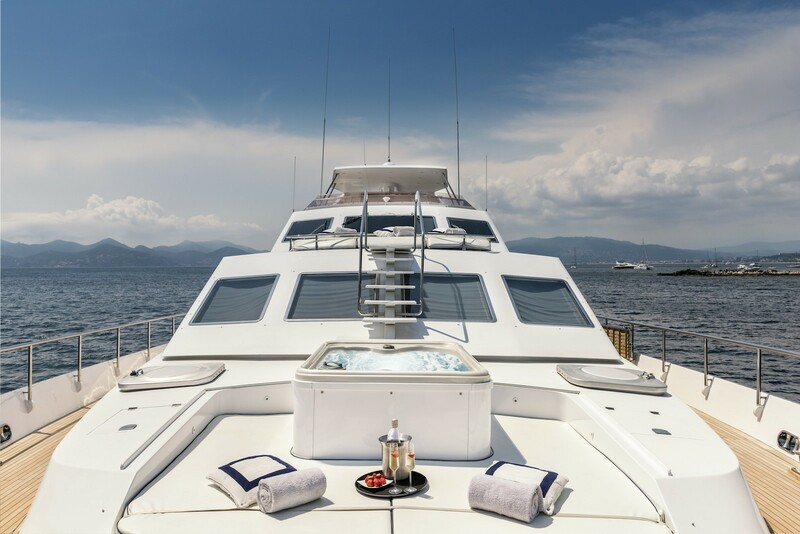 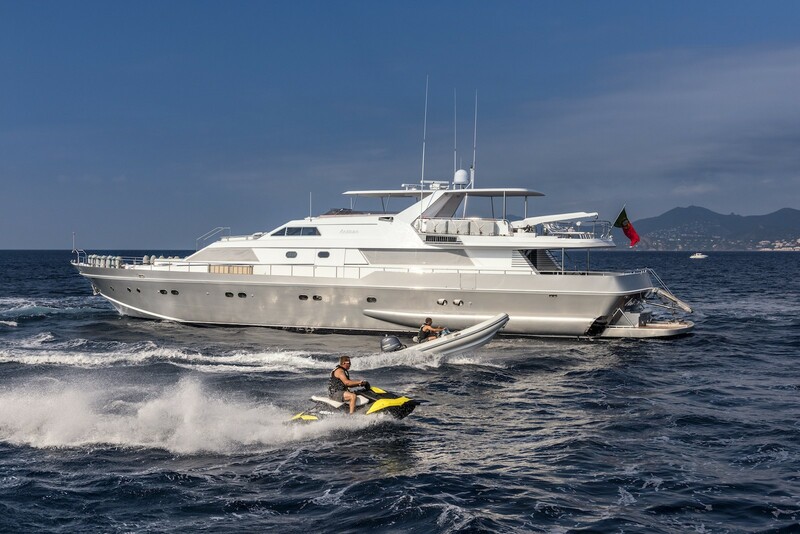 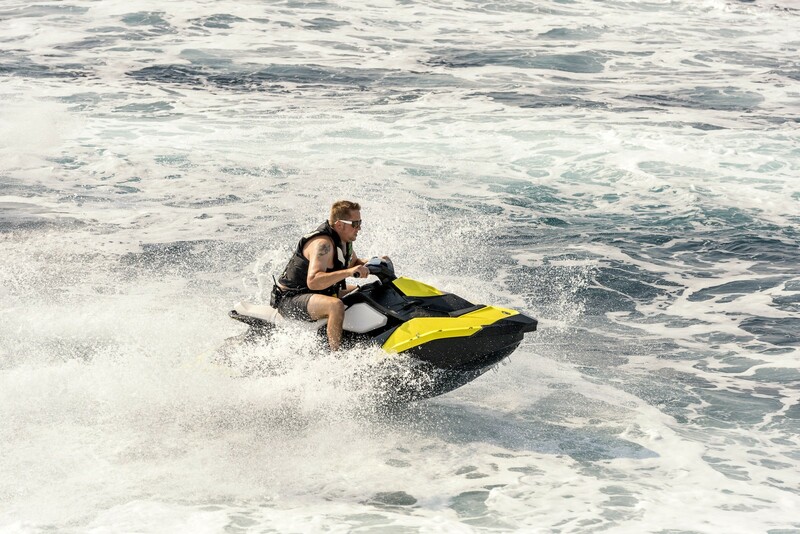 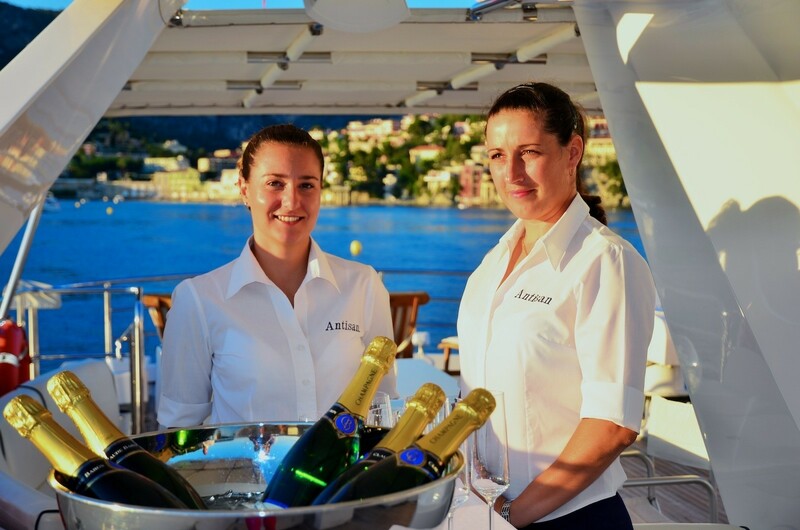 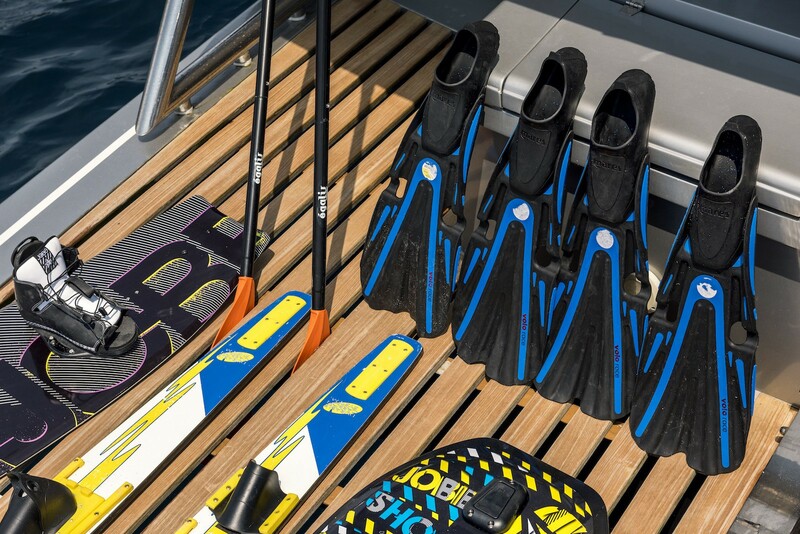 M/Y ANTISAN offers a comfortable cruising speed of 24 knots and a crew of 6 to pamper to your every need. 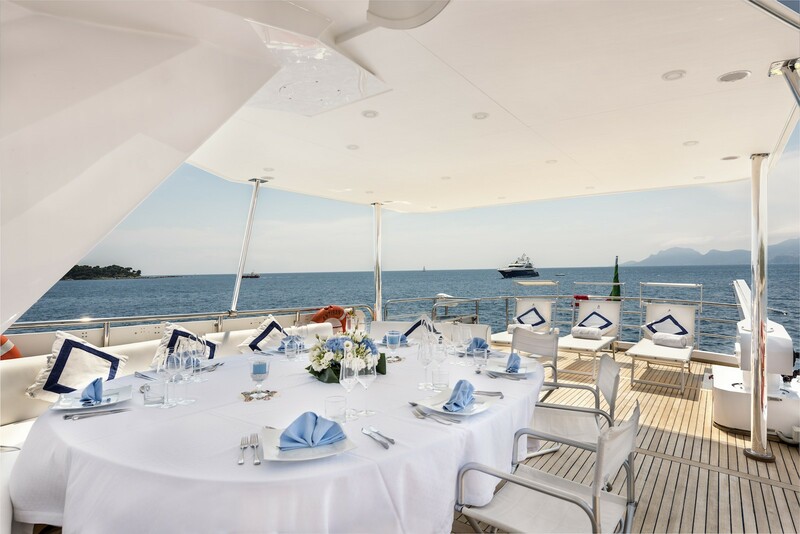 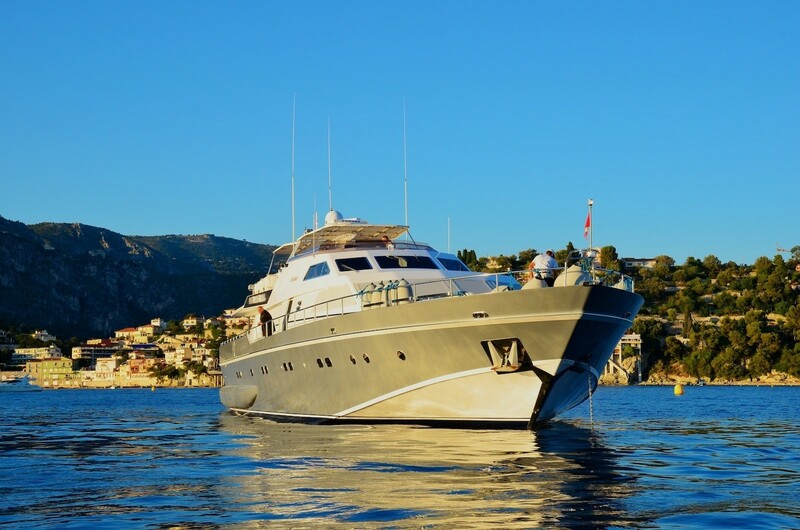 Motor yacht ANTISAN can accommodate up to 12 guests overnight with the ability to have 40 guests onboard cruising. 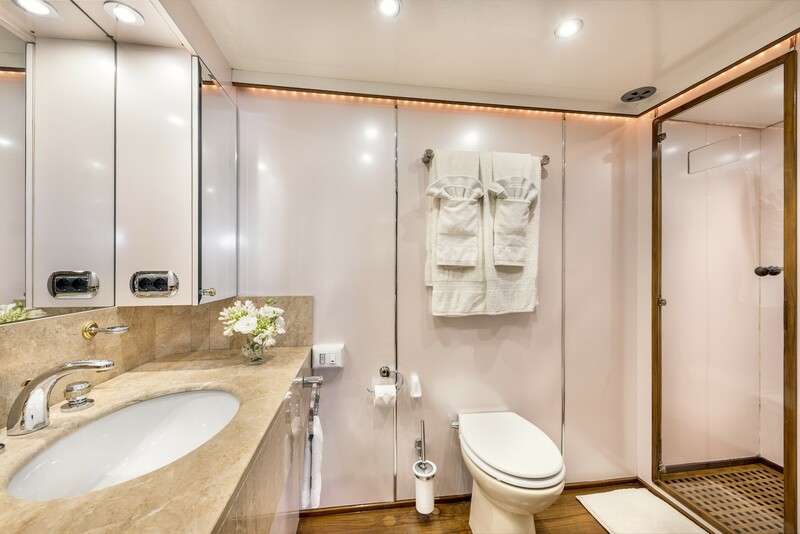 Her 5 cabins comprise of a full width master cabin located on the main deck forward with king size bed, sitting area, wardrobe and spa pool bathroom with shower plus a convertible sofa. The remaining cabins are located on the Lower deck and consist of 3 queen bedded cabins with stall showers, and 1 twin bedded cabin with stall shower plus a 1 pullman bunk bed. 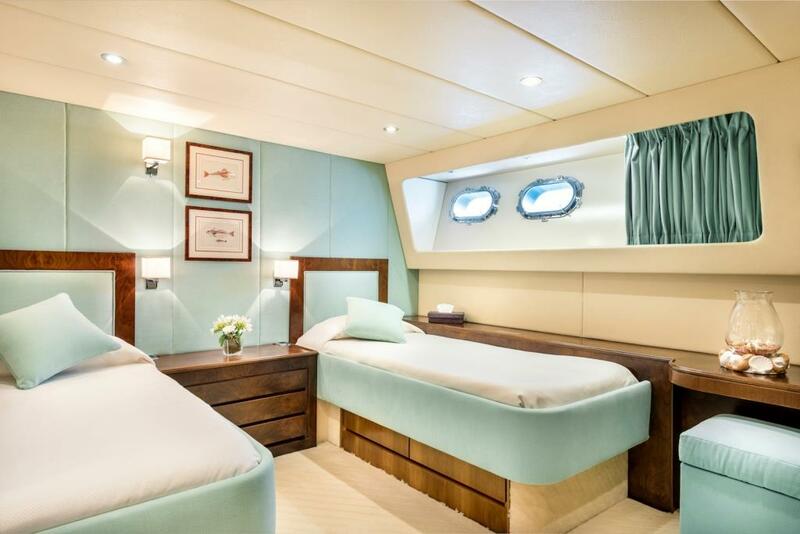 There is a TV with SKY Decoder and stereo in each cabin.